Home People V. the State Of Illusion Opening (almost) Nationwide! People V. the State Of Illusion Opening (almost) Nationwide! Now that Austin Vickers’s debut film will open nationwide in select cities (beginning March 2012), it’s time to share more about the profound impact this movie had on me. In my original review, I talked about the realizations I’ve made about life and how I planned to fix them. As part of this process, I agreed to attend Austin’s one-day The Trial, a full-day, Saturday class built on the same principles he explains in depth in his film. 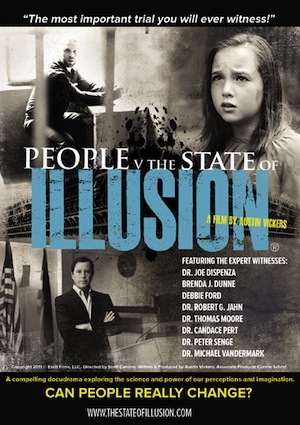 My thoughts on The Trial will be published tomorrow, but until then, enjoy the trailer for People V. the State Of Illusion which, thanks to Samuel Goldwyn Films, will be shown in at least eight U.S. cities in the upcoming months. Now that I’ve watched it four times, (three in theaters, once on Vimeo because I’m special), I KNOW there’s a ton each of us can learn from this film. I don’t have the release schedule yet, but it looks like Seattle is first stop in early March. Please see the website or contact me for more information on how to see this transformative film.